On behalf of DRS Pete Thorpe and Matt wright took a van load of aid to Calais on 4th December. They then volunteered for two days Matt in the woodyard and Pete in the kitchen.. Massive thanks to them both! 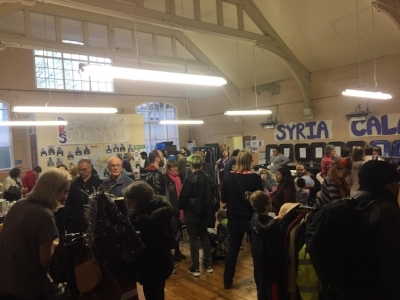 "My overall impressions are of an extraordinary place, with volunteers from all walks of life giving time and working very hard to a common purpose – the support and well being of refugees in and around Calais. Wood yard work. L’Auberge sends out 1 tonne of firewood every evening. This was made up of 65 large bags (over 12kg of wood) and 45 smaller bags (5kg). They have mapped the fire pits. Refugees are moved on every 2 days, but return to the fire pits; or new groups arrive and take over existing fire pits. The wood yard is well organised. Large quantities of pallets arrive – I didn’t find out how these are sourced, but I believe they are donated; as is other scrap wood. A large flat-backed lorry load of wood arrived while I was there. They do buy in logs/hardwood to augment the bags that are sent out. Bags are filled with some kindling; lots of softwood from pallets etc; plus a couple of logs/hardwood chunks. Essentially everything needed to get a fire going. These bags go out on the evening “distro” – distribution – which I didn’t get involved in. Wood yard work is essentially a production line operation. Outside the yard, pallets are broken up – see photo for tools including large homemade pry bars. Nails are flattened and the wood stacked on a pallet for the forklift to take through to the yard. Here there are 2 chop saws; operated by long-term term volunteers with appropriate training. There is a large store of wood here; more dry storage was being created while I was there. 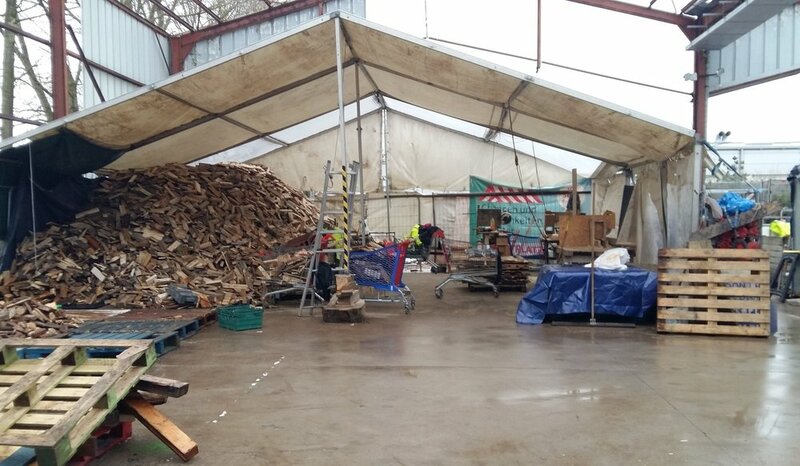 In the afternoon bags are made up – extra kindling is also produced if there isn’t enough small stuff from the pallet breaking. These are then loaded for distribution. The mix of volunteers was different each day; the person in charge of the yard takes everyone through the process, so the jobs and purpose are made clear. It is hard work; breaks for tea and lunch are taken and are important for recovery but also to chat and find out more. Wibb, in charge on my second day, was clearly proud of the set up he had up and running. He also filled in a lot of the background I didn’t know. From the press reports I’d read I thought the migrants who had returned to the Calais area were mostly young men. In fact there are many families there and many minors. There are 2 people in wheelchairs. For many of the migrants it is only a year or two since they were living normal family lives, so they are up to date with what’s happening – in music and football for example; they have phones and are in touch with what’s going on. Many have lived in Britain before and have friends or family here. Many would know exactly what to do if they were able to come here. They also know what is likely to happen – where they would be sent first for example. Returning to overall impressions, it seems there are many long term volunteers who have taken on roles managing wood yard, kitchen and warehouse. The organisation seemed pretty tight, especially given that each section could have a new mix of experienced and inexperienced volunteers every day. Meetings each morning set out the purpose of L’Auberge as well as ethos of respect for all; plus basic safety and common sense advice. I attended these both mornings; but if you were there longer you could get straight on with work. Information is everywhere – notices, see Pete’s photos; info from the people you work with; and field training if you were staying longer. People running the different sections seemed to have a real clear mission and grasp of what they needed to accomplish each day – how many meals needed; how much wood etc. I saw less of the warehouse, although I did help load a lorry with stuff not needed at L’Auberge and bound for another charity they work with. It does seem that nothing useful goes to waste. Although many volunteers, us included, knock off around 5 it’s clear that the work goes on after. Kitchen work carried on late into the evening and distributions go out. People I met were eager to chat; friendly; willing to work hard. It is an inspiring place to be for a few days. I imagine a long term stint would be hard. Some volunteers I spoke to had found cheap local accommodation with someone who had previously worked in L’Auberge. My personal advice if you go out – keep an open mind, try and get involved where you think you can be most useful; chat lots!" Container arrives safe and sound in Chios! After months of fundraising for freight and aid costs, collecting of aid, travelling up and down the country transporting aid, liaising with other grassroots organisations and independent volunteers for a big collaboration to enable us to send quality winter aid, baby products and food aid we sent our container of aid with lots of love from England. What an honour it was to be able to receive and unload the container in Chios! 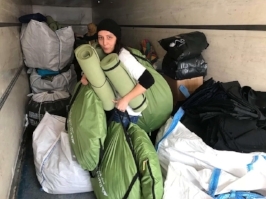 Special Thanks to Eva Andersson from 2HelpingHands who donated a substantial amount of Funds towards buying of the winter shoes and coats and freight transportation costs. All the Refugee Biriyani & Bananas, Refugee Relief, IRIS Centre, 2HelpinHands, One Family - No borders, Donate4Refugees, Norweigen and independent volunteers who helped unload the container in under 2 hours and went on to sort and pack shoes and coats for our upcoming winter aid mass distributions THANK YOU for all your hard work and dedication to the cause. Special Thanks to my brothers and sisters who are seeking asylum in Europe and helped unload our container and with the distributions. Despite being through so much and having so much taken away you all you do is give. Your support towards pur work is so commendavle. None of our Volunteering work would be possible without you and you are all so strong and you keep us strong! Hasib, Omar, Ahmed, Baby Samir, Qarar, Hussain, Siraj, Rahman, Khaled, Yahya, Sana, Aida, Amir, Prince Baktash, Zain THANK YOU! For all those who contributed towards the container you will be pleased to know majority of the aid has been distributed or allocated to different projects helping those in need. Watch put for upcoming updates. Thank you Yourgus a local Greek man who we rent our storage premises from- he helps us with everything and looks after us! To be able to send a 40ft container of aid this way is cost effective and maximises what we can do on the ground if organised wel. Help us to send another container of aid. Open Day and Jumble Sale success! Yesterday's Open Day was even better than we dared hope! Not only did we raise £650, we also got to spend the day in the most wonderful company! Thank you to everyone who helped to organise the day, who helped on the day itself and to everyone who braved the weather to come and support us! Every time you think DRS couldn't get bigger and brighter and bolder it does! Our lovely new home has made it feel like we have been in a chrysalis and now the butterfly is emerging...! So many thanks today....To.Sarah, Gill and the Greybrook primary school year 3 parents, to Sue and her husband (whose name I didn't catch, sorry!) for the generous donations; to Robin and Jeremy for collecting donations to deliver them to the next stage of their journey to Syria; to all our amazing volunteers! Today I am writing from Syria, where I have been visiting widows in Latakia. One of them used to live in Shtabraq, Idlib. One night while she and her family were sleeping, Al Nusra fighters came, killing the residents of this village in their homes and even in their beds. These jihadists had been hiding in caves, in fields and underground until the night they struck and took control of this village. The people I met said that around 1,000 jihadists arrived with guns and bombs. Many villagers ran away just in time but hundreds were killed and they described the bombs coming down like rain. Many of the victims’ throats were cut when this attack took place in April 2015. They killed the father of these children. He was not a soldier or a fighter, just a civilian like the rest of his family. But these jihadists killed him regardless, taking the rest of the family as prisoners. She tried to run with her children, and had to run up a ramp while trying to escape, but the terror she felt made her virtually incapable and she fell three times while trying to get up this ramp. One of her neighbours saw her 13 year old daughter being shot as they ran. She briefly held her in her arms as she was dying, then had to abandon her precious daughter to try to save her son in time. But her son was taken by them regardless. Some of the women were taken by the jihadists and were forced to “marry” some of the fighters. They were thought to be been taken to other countries. This widow and her four children were all put in prison. The youngest was just five years old at the time, and the oldest has a medical condition. They kept these little and unwell children in prison. She described how she was given 65 lashes with a leather whip. What could a simple mother of four have ever done to deserve this punishment? After nine months they were set free as part of a deal negotiated to release Al Nusra members that the Syrian government had in prison, in return for releasing these women and children that Al Nusra had been keeping in prison. The widow commented that most of the Al Nusra fighters they encountered, as much as 90%, were not Syrian, but were from other countries. This woman broke down in tears repeatedly as she told us of the fear and suffering they had lived, and that she wakes screaming because of the nightmares she has. She cannot forget. Her oldest daughter has disabilities but her other children go to school. So many displaced people have flocked to Latakia because of its relative safety compared with other parts of the country. As a result the schools are overcrowded and the children have to attend in two shifts. Some children do the morning shift of learning while others do the afternoon session. While her daughters go to school in the afternoon, this widow uses the opportunity to take on poorly paid farming work to try to cover the rent of the one room they all live in. It barely seems worthy of the high rent she has to pay for it, with paint peeling off the damp patches creeping up each of the walls. She simply cannot earn enough to support her four children. What this woman and her children have been through is too much. Simply. No child should ever have to experience being imprisoned to be used as a bargaining chip for the release of prisoners linked with a terrorist organisation. Widows like this in Syria desperately need our support, and they are not isolated or unusual cases. Too many people have had similar and equally heart experiences. We gave each of this widow’s children a new pair of shoes or winter boots to help see them through winter. We visited a number of widows and their children yesterday, giving new shoes to each of them. The daytimes are temperate but the nights are now feeling cold here, and the temperatures will continue to plummet over the coming weeks. I cannot bring myself to share the photos or videos we took today while I was with this widow. They have had enough of their dignity stolen from them already, so instead I will simply show you one of the streets where these women and children are attempting to pick up the pieces of their broken lives. Our little gestures mean a lot to them, and these women thanked me for being willing to come and be with them, showing love and support for them and their children. Such overwhelming generosity this morning!! 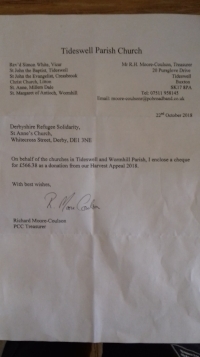 Thank you sooo much to Tideswell Parish Church for the huge donation and to Suzanne for bringing boxes and boxes of food and water on behalf of Tideswell Church and daughter churches. Thank you also to Sophie from Balfour Beatty for all the children's winter coats. DRS can guarantee that all these amazing donations will be on their way to Calais or Dunkirk on one of our two aid trips in November and December. Container to Chios on its way! **REMEMBER when you helped raise funds to send a 40ft container of aid. **REMEMBER when you helped raise funds to buy food supplies, shoes, coats, tents and sleeping bags. **REMEMBER when you collected winter aid in Newcastle, Northumberland, Middlesborough, Leicester, Loughborough, Derby and London. It was a mammoth and difficult task but we did it. We managed to load our 40ft container of aid to go to Chios Island, Greece to help those in the refugee camps. Rebecca & Adam Spilane and their entire team of LE Solidarity. A Special Thanks to Amy Sunshine, Steve Cook and the entire team of Derby Refugee Solidarity. Not only did they provide us with their premises for loading of the container at short notice, helped fill the container with aid until it was completely full, they came together with a big team of friendly people to help us load. I am so overwhelmed by everyone who helped prepare this container of aid and I am so thankful and grateful to see the immense love and care we have not only for those in camps but each other, volunteers, some of who we have never met before. Thank you to all the supporters, helpers and donors of Refugee Biriyani & Bananas. It was long day and some of us spent many many hours driving, transporting and loading. To be able to send a 40ft container of food and winter aid in collaboration with so many groups and individuals is a miracle in itself just like the beautiful rainbow which was in the sky just as we finished. Nothing says “Fashion Pioneer” like a DRS volunteer!! Thanks soooo much to everyone who helped in any way today, by donating, sorting or being at Tansley Car Boot Fair today. Even though the event was quiet, the team made a grand total of £237.73 (bloody Maths by Hassan). Amazeballs!! So, the "Packs for Calais" that were bought and started by a fantastic NCS team were finished off yesterday by an equally fantastic DRS team then collected by the fantastic Lesley Browne who took them to Sheffield from where they will set off to Calais on Saturday with lots of other aid. Fantastic people working together for a common goal. Is there any better antidote to all the negativity in the world?? ?